A day trip to the countryside. A morning of joy and wonder; frustration and contradiction. The Philippine story in a few hours… The Teen had a wonderful nanny or “yaya” from the time she was two years old until she was eight. Her yaya raised her by our rules, and while we, as parents, were extremely involved and around most of the time, we were eternally grateful to have such a wonderful and devoted nanny. When the right time came, her yaya indicated a desire to move on to bigger and better things, and we eventually arranged for her to work with some very good family friends in Hong Kong for some 4-5 years. She earned in dollars, lived the OFW dream and was able to provide for her large family back home in Cebu. We remained in contact and would occasionally see her in Hong Kong on our visits to the city. She would eventually return to the Philippines, find her soul mate, and decide to get married. Mrs. MM and I were asked to be a ninang and ninong at her wedding and of course we agreed. So yesterday, we got up in the wee hours of the morning for a 2.5 hour drive to a beautiful rural section of Tarlac to attend a simple and heartwarming provincial wedding. On our way to Tarlac, we passed the new SCTEX expressway and took the exit that brought us to Hacienda Luisita. It was an exit too soon, but the error was serendipitous for we would never have passed this stunning main road at Hacienda Luisita, lined with hundreds of 25-30 year old Acacia trees. The tree-lined avenue must have been a kilometer or more long, and I was so impressed that we stopped to take the photo above. If only we had insisted that roadways all around the country be planted and maintained in this manner. Gorgeous. The wedding was small but perfect. Simple but appropriate. 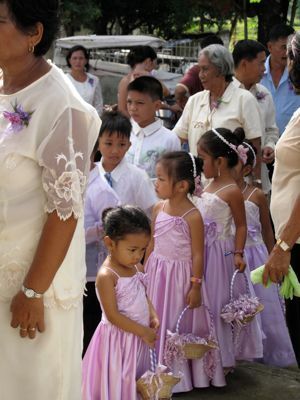 Guests were decked out in lavender-themed attire (I didn’t know barongs came in lavender and in all sizes, down to the ring bearer!). The priest, who I later found out was only a year or two into his profession, was young and idealistic. 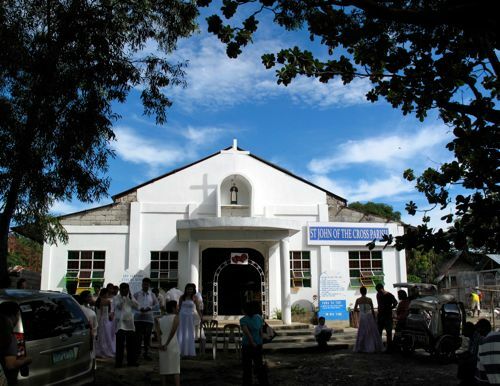 He had built this church with monetary donations sourced completely from the residents of the 18 different barangays that the church served. I have my personal views on marriage, ranging from the fact it was conceived when couples probably only lived until their thirties and therefore, only remained married for 15-20 years as opposed to up to 60+ years in today’s over-medicated society, or that I find it bizarre that we are one of two remaining countries in the world without divorce (I think the other is Malta), or that a successful marriage is a statistical crapshoot as more than half of all marriages seem to end badly, etc. Nevertheless, I completely understand that marriage and families do seem to have a huge role in societies, and despite the risks, people continue to cherish the institution. Red, yellow and blue coupes. At full price, probably worth PHP20 million at least. 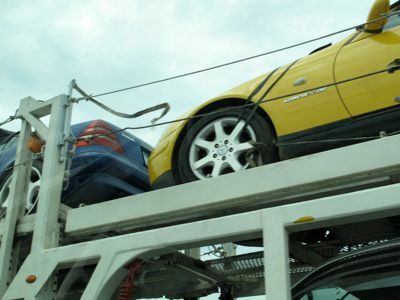 During a previous administration’s reign, smuggled luxury cars were found coming into Cebu through the small port of Toledo, and hundreds of vehicles including lots of BMWs were found to have bypassed customs and large duties. I hope, for the country’s sake, my overactive imagination is completely wrong/unfounded, and that there is a legitimate explanation for this rather blatant display (in broad daylight) of conspicuous consumption. It was a depressing thought, nonetheless. I love your photo of the chapel. I wish they made the sign simpler or did it in neutral color. Anyway, it’s a nice countryside scene….just loved it! SCTEX is the best! my uncle boasts he traveled from Hermosa,Bataan to Clark, Pampanga in 15mins! MM, i’ve seen a red barong! hehehe marketman, tapat ng nepa Qmart yang overpass sa last photo mo…dyan ako namamalengke ng isda at karne supply naming magkakapatid for one week. 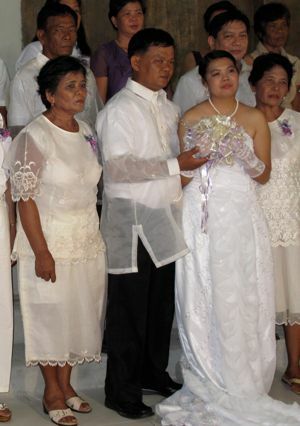 Such a lovely story – the wedding, the countryside, musings on bayad na ba ang luxury taxes – yes indeed MM – this set off many thoughts as serendipitous as your finding the church – over the hill, do-on malapit lang. A client – a ranking officer of of Automotive Competitive Counciil – once intimated that Cagayan was the entry point of for hot cars which had retailers up in arms because not only were cars being smuggled but oil too. The understanding that time was a quid pro quo between a Senator from Cagayan and the last Malacanang Occupants. Dismantling this is really easy except that the Senator is still an incumbent – with even more powers. 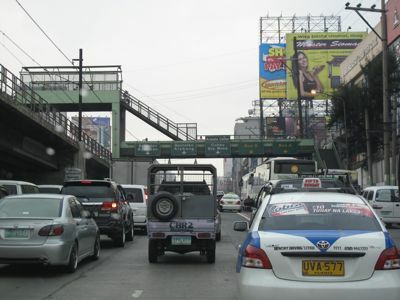 Hi MM, I get the same depressing feeling when after a provincial trip, after the airport, and then on to EDSA….all of a sudden reality BITES. What a lovely ending for your teen’s ‘yaya’ :) Yes, barongs come in a rainbow of colors nowadays, even for the big boys, hehe… only in the Philippines! And what an interesting day for you indeed, from “green” to “grey”! From the serene landscapes, then back to city smogs. MM, I share some of your sentiments on marriage, and that ironically, some priests who are not married themselves seem to think of themselves as “experts” on the institution. You’re right, Malta is the only other country where divorce is not permitted. this is beautiful storytelling, MM! Wow sir, you were in my hometown and you passed by Hacienda Luisita!!! My grandparents actually do live inside the hacienda because they used to work for the Cojuangcos (who, according to my lola, are the nicest people- especially daw yung mother in Pres. Cory). Mr. MM ganito talaga ang typical na kasalan sa probinsya. walang pictures from the reception? sa amin sa bulacan pag may kasalan halos lahat ng kapitbahay ay tumutulong sa pagluluto. nakapalda at may mga dalang kutsilyo at bimpo (towellete) ang mga nanang. ang mga ninang at ninong naman may pasunod (loot bag) to be taken back home which normally consists of imbutido, pritong manok at leche flan. how i miss occasion like this in the province. work and school brought us to quezon city. for us who frequent Ilocos, the SCTEX is a big blessing that it cuts down travel time. waaaahhhh!!!! i miss manila! that last pic is in Pasay? I miss 31 degrees everyday!!!! Raised in Moncada, Tarlac, those pictures reminded me of my childhood. 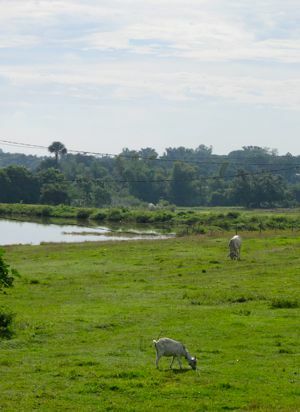 from the carabao dung to the green grassy fields to simple churches, I truly miss them. 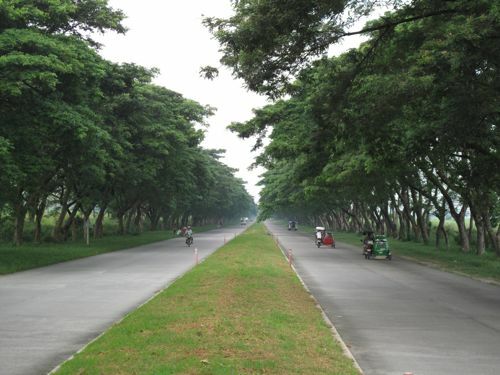 the acacia tree lined road reminds me of the road before San Fernando(?) in Cebu when you are going South. It is just awesome to see these very old trees overhanging the road. I hope they won’t be cut down as they did the trees in Dakit, Barili. Very bucolic, love the pictures. such a gratifying story. what a handsome couple, and the flower girls are so pretty! those acacia trees are gorgeous! 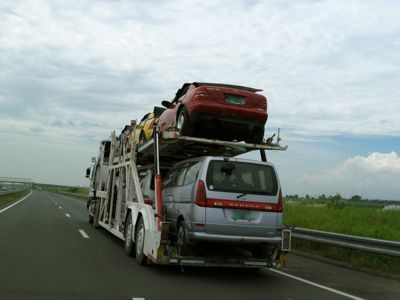 for the sake of the consumers in the philippines, i hope those cars were not smuggled. that is so sad, if it were. makes me think now – which is more sadder? the consumers who buy them, knowing (or not) that it’s been smuggled? or the tolerance of it being smuggled? It’s sad that the priest says “wife shouldnâ€™t nag her husband constantly about mistresses or girlfriends”. How about “husband shouldn’t have mistresses or girlfriends”? very typical probinsiya wedding yet I love how that young priest admonish the new couple diretso…you see napaka- natural ang idealism niya. Let’s say, as married couples we know the realities of being together but then I would rather still be reminded of the marital rules :-). I know young priests too kasi who ooze with such local color yet they strive to be foot soldiers of God in such a jaded world. I wish we have a lot of trees here in the urban Manila, just like in Singapore… wishful thinking. Blaise, Singapore’s landscaping was partially inspired by landscaping of Manila in the 1970’s, under Imelda, I was told… how sad that Singapore took those ideas and have made them really work all over their small but wonderfully maintained island… we have cut down most trees in the urban streetscape. it reminds me tuloy of the acacia tree in my elementary years…… sayang putol na lahat. ganun talaga sa probinsya, simple lang ang buhay. Kung minsan, pag wala kang ulam, punta ka lang sa kapitbahay, magkakaulam ka na…. 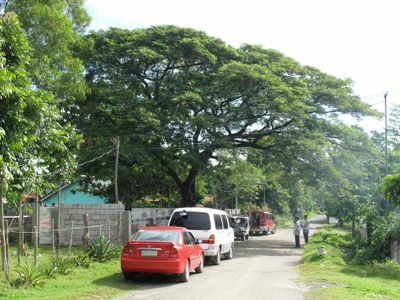 But now, it is changing in color especially with the advent of subdivisions…… naging exclusive na rin mga neighbors……..
MM, I just learned from a graduate of Forestry that what we all know as Acacia tree is not the true Acacia but a Raintree. They both belong to the same Family but of different Genus.The true acacia tree is also known as a thorn tree or wattles.And the raintree which we Filipinos call “Akasya” is also known as monkey pod.Interesting eh? Your gut feeling or instinct is correct. These vehicles passed through our customs with some “bend the rules a bit” schemes by the importer in connivance with the broker and with imprimatur of the customs collector ( through his examiner on duty of the port of entry, which is subic probably )…learned of this modus after being assigned at Subic during PASG days…so sad we are not only dumping grounds but cheated of taxes too…..